"Re-Use: The first eco-step is re-using stuff, so we make our products extra durable so they can be handed down and used by the next generation. Re-duce: We love the world to live in, and we want future generattions to enjoy it just as much as we've cut down our emissions by expanding our product facilities. We currently have factories in the UK, US and China. Re-Cycle: Trunki ride-ons were specifically designed for disassembly, meaning that that any returns we receive can be fixed or recycled. 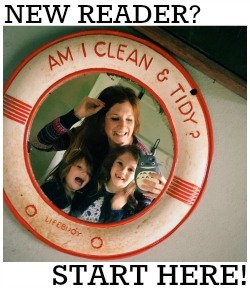 The fixed ones are donated to a local Children's Hospice and the others are give to the Children's Scrapstore." On top of this, all their products are lovingly made in Great Britain too - and you all know that I am a very keen supporter of Buying British! Hurray! After writing my A-Z of Holidaying with Children post, I was approached by Trunki and asked if I'd like to review one of their BoostApaks. With a holiday lined up in the not too distant future, and regular trips in other peoples' cars (I'm without one during the week as Himself uses his for work) I jumped at the chance. It's a legal requirement for all children under 12 (or 135cm) to use a booster seat when travelling in cars, so it's a great idea to have one to hand at all times in case you go on an unexpected trip in a friends car (like we do a lot) or in a taxi. The BoostApak is EXTRA handy though as it is also a spacious, hand luggage approved backpack! Daisy received the pink one and loved it straight away! 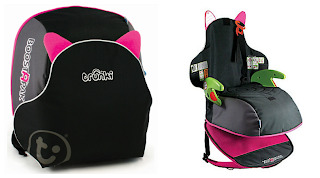 It's a bright bold pink, and the back flap has little horns on it which makes it look like a monster. We didn't actually have any car journeys planned for a few days, but that didn't stop her packing it with bits and pieces and wearing it around the house. It's deceptively spacious and not as heavy as you'd imagine (although it is heavier than a regular back pack as the seat is made from a hard plastic shell). If we were off on a long journey, I think I would have to carry it on Daisy's behalf, but then she is only three. When the time came for us to use it in the car, despite it having diagrams on how to fit it on the seat itself, I did have to look up further instructions on YouTube. Once I'd watched this video, though, it was super easy to put in place, and felt very safe and secure too. Daisy enjoyed travelling on it and felt very grown up. She said it was very comfortable to sit on - although her favourite feature is the space inside for her colouring books and toys! My favourite feature is that the material of the bag is wipe clean AND removable and machine washable, so if it gets a little (or a lot!) grubby I can clean it no problem. 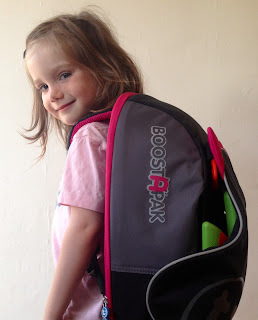 In my eyes, the BoostApak really is the ultimate holiday essential - you can pack it full of snacks and games to keep your youngster entertained on the journey, they can carry it on their back themselves, it is aeroplane approved hand luggage - and you can use it in taxis or hire cars too. But of course it's not limited to international travel! If, like me, you car pool regularly, this is a really handy bit of kit to keep at home. Its also great for taking on public transport as it means little ones can see out of the windows easier, plus it's a great purchase if you often have extra travellers with you in your car! I've been considering getting one of these as we don't own a car but need a seat now and again and obviously a group 1 car seat isn't exactly portable. My daughter is only 3 although she IS 15kg. I keep reading that you need to go by weight rather than age but still not sure. They are not great for kids who fall asleep in cars, hardly any support around the neck. But for short journeys they are good.